About a month ago the controversy surrounding Zero Dark Thirty had to do with whether the film, in spite of its fact-based account, was pro-torture. Recently that has been replaced by a more tangible controversy – whether or not it is a fact-based account. John McCain, for instance, has spoken out against the film, claiming that the torture depicted in the film – or “enhanced interrogation” – was not as instrumental to finding Osama Bin Laden as the film might suggest. Zero Dark Thirty’s early torture scenes, in which two CIA operatives named Dan and Maya starve, beat, and water-board a Saudi-Arabian Al-Qaeda operative named Ammar, are the source of most of the controversy, because they suggest, in no uncertain terms, that the torture worked. The operatives are able to extract a name from the interrogation – Abu Ahmed al-Kuwaiti, a courier who worked for Bin Laden, and the man they will spend the rest of the movie trying to find. If people want to claim that torture played no part in finding Bin Laden, then them acquiring that name from Ammar would have to be factually inaccurate, and by most accounts, it isn’t. Sorry John McCain. One note of interest is that the interrogation being depicted was actually meant to procure information about a coming attack by the “Saudi Group,” a terrorist cell within Saudi Arabia, and in that regard, it was unsuccessful. The attack still occurs, as do many others throughout the film’s ten year time-span. But in some ways that point seems irrelevant, because proponents of enhanced interrogation have always viewed it as a means to an end, and in the end, they do kill Bin Laden. The movie is not sugar-coating anything, nor is it blatantly anti-torture, which is something also being spun through drastic misinterpretations of the early scenes. 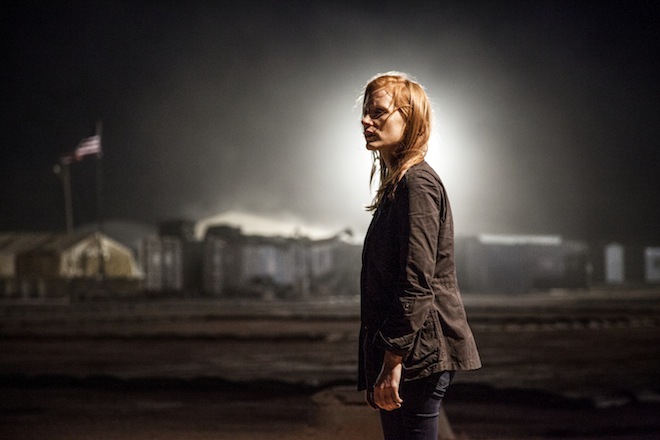 For example, in her review of the film in the New York Times, Manohla Dargis writes, “The abuse scenes are crucial to Zero Dark Thirty because they serve as a claim that these interrogation methods are unreliable when it comes to producing actionable information. It is only later, when Dan and Maya lie to Ammar, sit across from him at a table, talk to him like a human being and give him food and a cigarette, that he offers them a potential lead.” What Dargis misses, possibly out of some inherent desire for the film to land on the side of good, is that when Dan and Maya talk to Ammar like a “human,” it is a very calculated decision. They know that his abuse and sleep deprivation have completely warped his mind, making him vulnerable to the lies they use in order to extract the information. Make no mistake about it – the plan worked. Thus, before the debate goes further, I think people need to get a firmer grasp on what they are actually upset about. Liberals mostly seem to think the film is inaccurate because they want it to be inaccurate. The argument against torture has always existed on two levels. The first argument, and my own, is that torture is immoral. The Bush administration and other conservative movements have tried to obfuscate the definition, using ambiguous terminology like “advanced interrogation” in place of “torture.” This is something liberals never bought into. Water-boarding, sleep deprivation, and other cruelties are, to us, a violation of the Geneva Conventions, a molestation of Western values, and a desertion of the moral high ground. It makes us no better than our enemies. The second argument against torture, and the one that Zero Dark Thirty has seemingly challenged, is that it doesn’t work. People under duress will say anything to make the madness stop, providing false leads and unreliable information, creating a mess of intelligence that exacerbates the problem further. Liberals ask outright: if torture is immoral and unreliable, how could it possibly be defended? Here’s the misapprehension: saying that torture is unreliable is not the same thing as saying that it never works. If one in every hundred detainees breaks and provides information, it is fair to conclude that it is not an effective tool, but that single person also eliminates the notion that it never works. The question to be asked is not “does torture work?”; the proper liberal question is: does the amount of useful information acquired from torture justify it in proportion to the morality that it simultaneously compromises? My quick answer is, and always had been, absolutely not! Yes, Zero Dark Thirty makes the claim that accurate information was attained from enhanced interrogation. My take on this is not unlike the Infinite Monkey Theorem: a thousand monkeys at a thousand typewriters with an infinite amount of time will one day produce Shakespeare. Keep at something long enough, there will always be minor successes. Liberals need to be realistic – the idea that torture never works is too naïve and idealistic. In many cases torture doesn’t work; in this case, it did. Zero Dark Thirty is just presenting the facts, and its sense of neutrality, even journalistic integrity, is possibly its greatest accomplishment as a movie. Director Kathryn Bigelow said herself, “Those of us who work in the arts know that depiction is not endorsement.” As a person who also dabbles in the arts, people’s inability, and at times, unwillingness, to except this basic fact has always been a huge source of frustration for me. And in the end, I think that is the real heart of the controversy over Zero Dark Thirty. There is such a thing as art and there is such a thing as politics, and people on both sides can never seem to reconcile the two. Hello everyone. The author of this blog, me, goes by the name of Matt Abra. I am a student in Creative Communications who is using this blog to communicate with you...creatively. I love all forms of art - movies, books, TV, theatre, "art" - but I also tend to get frustrated by the endless parade of bad choices that are slowly turning the artistic form into artistic dirt. So, naturally, I felt like talking about it. And I would love for you to talk about it with me. Please comment, and please disagree. A healthy dialogue is only for the better.